It’s holiday party season, and I don’t know about you, but I cannot show up to a party empty-handed. I love contributing to the menu, no matter what time of day the party is. 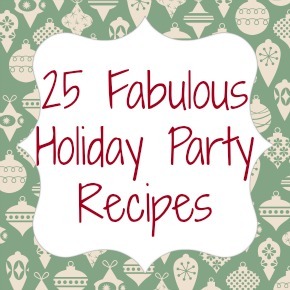 I have put together a list of my favorite Holiday Party Recipes to share with you just in case you are looking for some holiday party recipe inspiration this time of year! And don’t think I’m crazy, but I threw in several recipes not just because they are delicious, but because their red and green ingredients make them look festive. It’s time to celebrate! Bali Maki ~ Meat on a stick….everyone’s favorite appetizers at your local Chinese restaurant. Chocolate Chip Cheeseball ~ Here’s another super easy recipe, and it always makes the sweet tooth party goers happy. 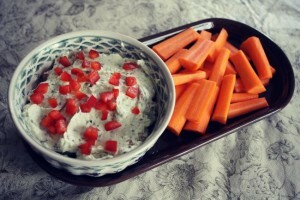 Pesto Cream Cheese Dip ~ Throw some chopped up red peppers on top of this dip for a red & green look! Star Puff Appetizers ~ Try this with holiday shaped cookie cutters! Tomato + Basil + Mozz Appetizer ~ This recipe is so easy my kids can help me put it together…and it’s red and green to boot! Homemade Pizza ~ These will take a little bit of work, but for smaller parties homemade pizza can be a manageable dinner, and you can make it interesting by letting everyone top their own. 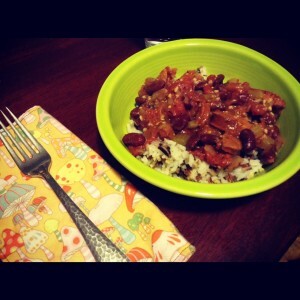 Skillet Red Beans with Rice ~ Put a pot of Red Beans on the stovetop or in a Slow Cooker and serve in small bowls. Spaghetti & Meatballs ~ Having an Italian style holiday party? This is a great recipe to serve your guests. Truck Stop Chili ~ This chili take a bit of work with the chopping and such, but put it in a slow cooker for your holiday party and your guests will go gaga! Crunchy Slaw ~ If I need a super easy side dish to take to a party this is my go-to recipe. Garlic Asiago Risotto ~ Easy Slow Cooker recipe that makes a ton of risotto for a perfect side. Mexican Fiesta Macaroni & Cheese ~ This mac has a little kick and is a crowd pleaser for sure! 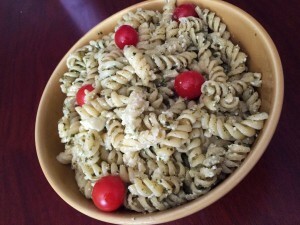 Pesto Pasta Salad ~ Again, I chose this one for the red & green colors, but this pasta salad really is a hit at parties! Mini Egg Frittatas ~ These are pretty easy to put together and your guests will think you spent all morning cooking! 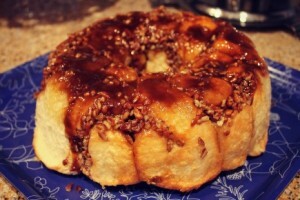 Pull Apart Coffee Cake ~ I make this amazing concoction every Christmas and Easter to take to Michael’s family’s holiday parties, and there are NEVER leftovers. 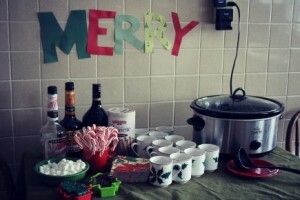 Hot Chocolate Bar ~ This is always a fun way to serve hot chocolate at a party, for kids AND adults. Bourbon Slush ~ This slush is a hit, and you can make it days or even weeks in advance to have on hand in the freezer for parties. Pretzels with Chocolate & Almonds ~ These aren’t just great for parties, but also for holiday gift giving. Pudding Shots ~ So many flavors….so little time! Snickers Pie ~ This recipe is a HUGE hit and it makes two pies, so you can take them to two different parties or save one for later! Sugar Cookies ~ This is the recipe I use every year to make our holiday cookies, and it’s scrumptious.